Herbal teas work like wonders. Choose to go for a caffeine-free start and end to your day. It will not only detox your system but also help you sleep contentedly. The best bedtime herbal teas include passion flower, chamomile, lavender, lemon balm, and a simple lemon honey tea. Hot beverages raise your core temperature and keep you away from tossing and turning all the time. Another best option to stay warm and sleep comfortably all night is an electric blanket. And these do not come inexpensively. As opposed to what you might be thinking, electric blankets don't even make use of a high energy. You will not incur excessive electricity costs. Technology is much advanced in today's time and electric blankets come with energy-efficient features to help you save a fortune. These aren't at all hazardous and keep the fabric heated with a wiring mechanism inside. You can also control the heat with the setting knobs provided. What more would anyone want, right? Put on your woolen socks so they can retain your body warmth as feet are the first to feel cold and lead to a poor blood circulation. Once the circulation gets weak, layering up your bed will also not help! Next, wear sleepwear that's comfortable but also keeps you warm enough to not feel the cold. Choose wool or flannel material and also go for sweaters that have long sleeves. Because if you are not able to sleep comfortably, you can also not wake up feeling energized. But, ensure that you aren't getting too warm. Stack yourself with layers and not just one big fluffy suit. This will allow you to shed the layers as you warm up at night. Make sure to block all the drafts in your room. For instance, openings under the doors allow air to keep passing in and out of your room which keeps the room temperature cold during winters. So, you can either stuff some rolled up cloth or glide under a thick doormat that obstructs the air flow. It'll prevent cold air to enter the room. Small cracks in the windows too can keep your room cold and make you feel uncomfortable. Gaining benefits of the natural body heat is the best way you can opt for. Move in close with your partner or get your pet in the bed for that good night's sleep. And believe us, it works! It keeps you warm throughout the night and you also get the time to cuddle up with your loved ones. 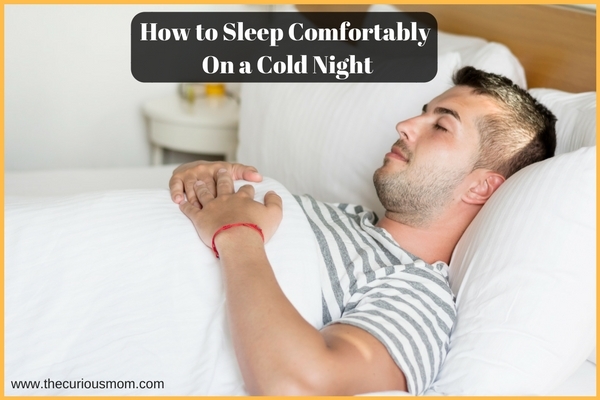 Now that you know how to keep yourself warm, try these ways and stay all comfortable!